Over previous sessions, with support from the Parent Council, we have been piloting the use of Show My Homework. The functionality of SMHW has improved significantly and it has also become much easier to access for learners and teachers alike, through use of their Glow (RM Unify) Launchpad. 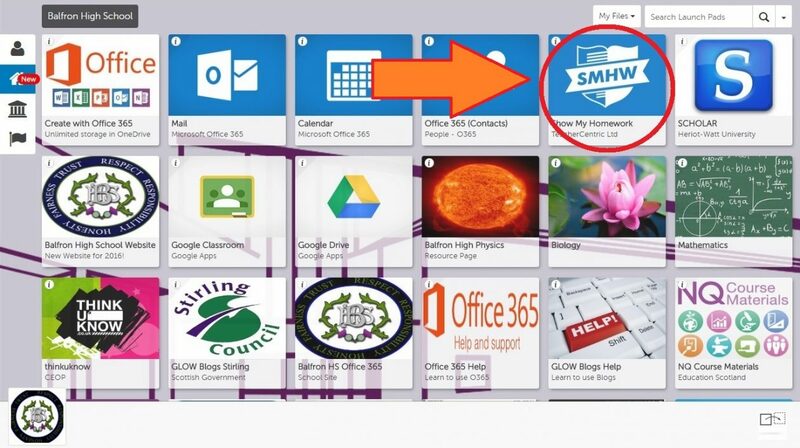 Logging into Glow, then selecting the SMHW tile means that pupils do not need to remember additional passwords. It also ensures that the homework shown is personalised to each pupil. Parents are also able to access SMH through a unique code, linked to their child. Codes have been issued to all parents of S2-S6 pupils over the last two school sessions. These remain valid. Codes for the new S1 and any new pupils will be issued in Early September 2018. Please email Mr Slavin if you need further information. Click here for the parent login page. SMHW can also be accessed on Android and iOS devices. For pupils and staff, using the Glow Launchpad requires no further authentication – they are already recognised by the system . For parents, click here for the parent login page.